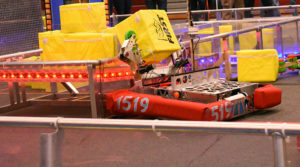 At the unofficial Week Zero Scrimmage on February 17 at Bedford High School, we were thankful to have an opportunity to run our robot on a real field and see all the interesting designs that area teams have developed. 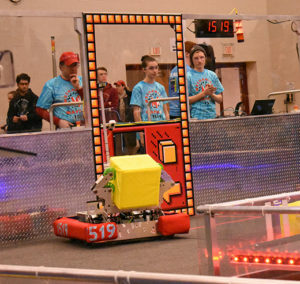 Since various challenges during the build season have delayed our robot assembly, our robot capability at Week Zero was lower than what we had envisioned. However, our robot was able to pick up and score cubes on the Switch. Our elevator mechanism had been designed and CAD’d but was not fully manufactured, assembled, programmed, and tested, so we could not score on the high Scale. Even though we seeded second from last, we had a great learning experience and look forward to the official competition season coming up soon!